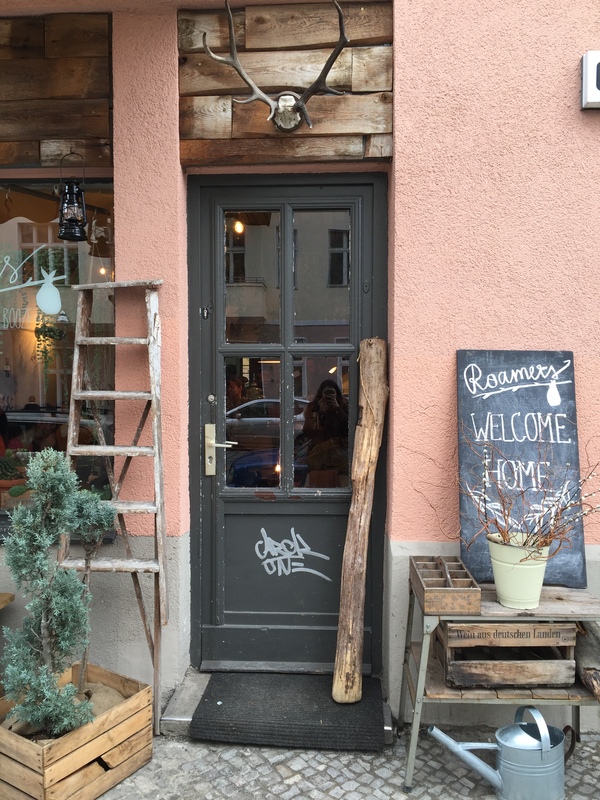 This is the third installment of a series that I called ‘where to eat in Berlin’ but should really be called ‘things I like to eat in Berlin and I think you should try too if you have a chance’. To read all about the first restaurant, Tangs Kantine and Cocolo, go here and here. Roamers is genuinely tiny, adorned with cascades of all sorts of plants and flowers and herbs and greenery, with small wobbly tables all jammed in like in a game of tetris, where you’ll have to sit cheek to cheek with well-dressed intellectual-looking couples and big families and kids with their sticky toy cars. In Roamers, they just love their greens. Rosemary is piled on a lavender cake, bunches of thyme adorn bright lemon loaves, sweet and sticky with syrup; fragile mint leaves are scattered on brownies. 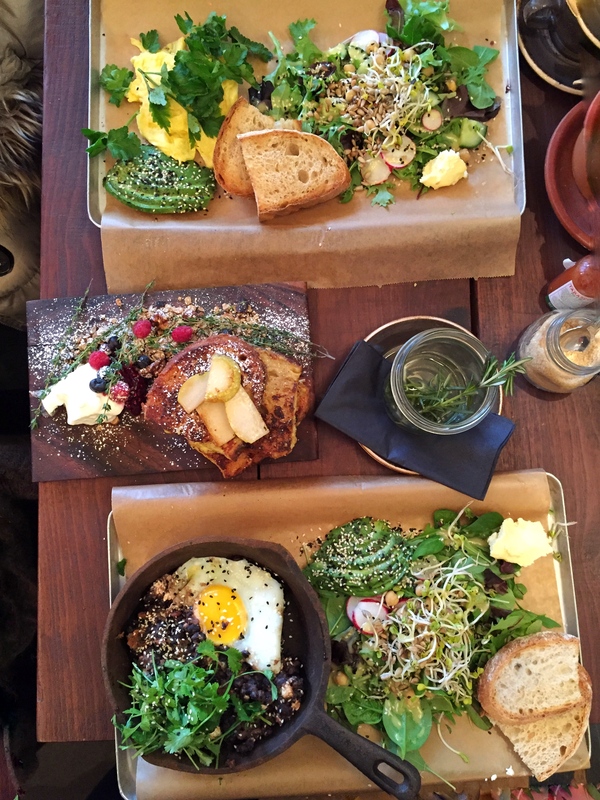 Every dish is beautifully plated with a side salad and generous bunches of herbs, served on a wooden board. 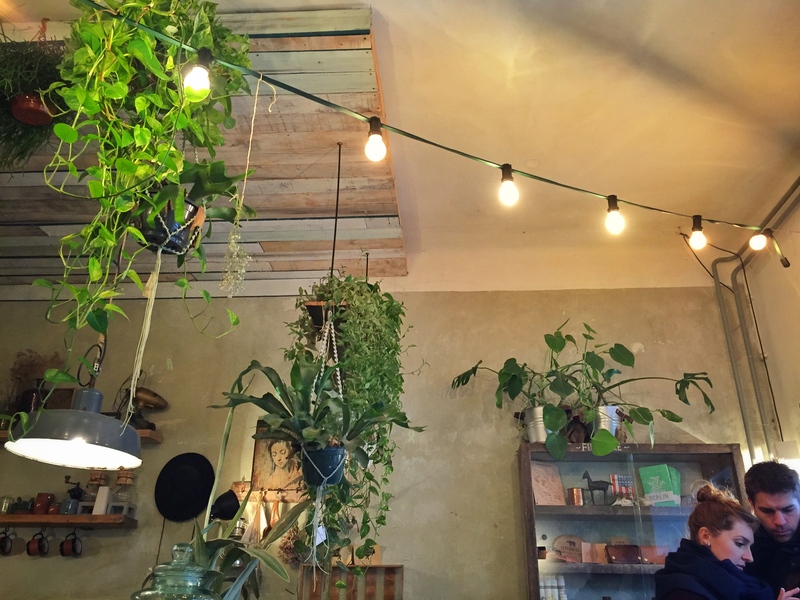 Tucked away in a grey corner of Neukolln, every detail in Roamers is reminiscent of nature itself, the porous wood, the aromatic herbs, fragile plants growing out of the stone animal heads on the walls, their list of peculiar infusions (they serve fresh rosemary and thyme tea). The roamer’s beans were a starchy, warming, soft comfort blanket covered with spicy tomato salsa, a beautifully runny egg, its yolk sticky and oozing, and coriander. The scrambled eggs were a perfect creamy canvas for the breakfast salad and its vibrant dressing to shine. We shared a side of French Toast (that’s totally a side) which was incredibly fluffy, just sweet enough, its corners almost blackened by the burnt syrup and the middle fluffy and creamy. I’m going to make a big claim: Roamer’s is my favourite brunch place. Of all time. In the whole world. There, I’ve said it. It’s not often I get to gorge on French toast and then feel good about it because of how green my plate looked. “Small wobbly tables all jammed in like in a game of tetris” and “kids with their sticky toy cars” – I *love* your descriptions. And I think you are right about Roamers being the best brunch place in the world. Aw lovely Hedda! Thank you!